Security and transparency are critical to verifying that an earner has been issued a valid digital credential by your organization. 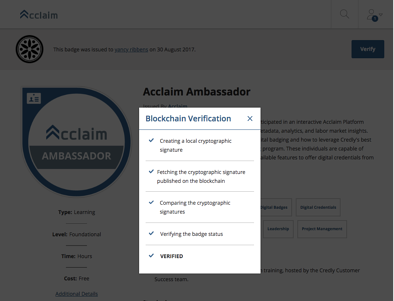 Recording digital credentials on a blockchain brings an additional level of external verification to the issuers and earners using Credly's Acclaim platform. Why Blockchain? Blockchain adds an additional level of external verification for issuers and earners of high-value credentials. By issuing digital credentials on the blockchain, it communicates to users that your organization uses the latest technology supporting high-volume verification requests of future-proof and tamper-proof credentials. How Do Credentials on Blockchain Work? Your organization enables blockchain validation for any credentials you issue. The earner accepts a blockchain-enabled credential and publishes it to the blockchain, which records the transaction. The credential can then be verified in real time by third parties on the blockchain. Which Blockchains Are Supported? Recording digital credentials on the Bitcoin blockchain is currently available. Credly’s blockchain architecture is designed to be extensible and blockchain-agnostic. What Does it Cost? Nothing. There are no additional costs to record your digital credentials to blockchain--for your organization or your earners. Data Security & Integrity: Credly is fully GDPR-compliant and trusted by thousands of organizations to ensure the security and integrity of every digital credential issued, earned, and shared on our platform. For certain applications, blockchain brings an additional level of external verification to your credentials.